Kalispell, Montana – ClassOne Technology (classone.com), manufacturer of Solstice® plating systems for ≤200mm wafers, announced a new plating technique that provides significant cost reductions for compound semiconductor manufacturers who use gold plated vias. "We have compound semiconductor customers that use gold for via liners who are switching to copper to save money," said Kevin Witt, President of ClassOne Technology. "When they implement the copper plating on our Solstice ECD system with the ClassOne’s CopperMax™ chamber dramatic cost reductions are obtained – on the order of 70% lower metallization cost compared with their previous approach." Witt explained that the new savings result not just from replacing the bulk of the Au with Cu but also from the additional copper-plating economies made possible by the unique CopperMax chamber design. Witt noted that consumables have been the largest single cost factor in copper plating because the process required large volumes of expensive organic additives over the lifetime of the bath. But now, by employing a cation-exchange membrane to separate anolyte from catholyte, the CopperMax chamber effectively isolates additives from the anode, drastically reducing additive depletion and therefore usage. And since the CopperMax bath remains clean much longer, bath life is extended by 15 to 20x resulting in increased uptime and throughput. 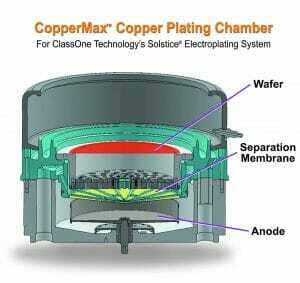 CopperMax also reduces Cu anode expenses. Instead of solid machined Cu material the new chamber is able to use less expensive bulk anode pellets, cutting anode costs by over 50%. Plus, since the pellets provide much greater surface area the maximum plating rates can be increased. In addition to the process improvements, the net result is a very significant reduction in cost per wafer: Compared with previous Cu processes the CopperMax chamber reduces additive consumption by over 95% resulting in an overall cost of ownership reduction of almost 50%. And for users who switch from Au to Cu via liners and do the plating on a Solstice system with CopperMax, the costs are cut by roughly 70%. ClassOne Technology (classone.com) provides innovative and affordable new wet-chemical processing equipment for users of 200mm and smaller substrates, including many emerging markets that have been underserved by the larger equipment manufacturers. ClassOne’s products include electroplating tools for development and high-rate production as well as spin rinse drying, spray solvent tools and more. Based in Kalispell, Montana, ClassOne Technology is built upon decades of experience from industry veterans with a tradition of delivering advanced performance tools at lower cost. ClassOne Technology is a sister company to ClassOne Equipment (ClassOneEquipment.com), long respected as the industry’s premier provider of refurbished processing tools, with over 2,500 systems installed worldwide.